In A nasty encounter, the fourth installment of The red empire strikes back – fighting the Great Patriotic War one battle at a time, Andrew Rolph continues his series of Ostfront scenarios with a fast-moving encounter where there’s almost nowhere to hide. In Wargamer’s Rut, James Underwood has some sage advice and supportive words for wargamers dealing with lead and plastic mountains. Surely, that doesn’t mean me? Lights, camera – action! The Editor goes behind the scenes with ﬁlm maker Joseph Piddington who has dedicated his life over many months to creating the ultimate documentary about our hobby and the people involved in it. In Marche ou crève, Belgian wargamer Phil Dutré describes the game he created for CRISIS 2015 in Antwerp, complete with the rules and cards used in the game – and 2-D figures to play with! In Grenouisse at bay part 2, The Editor continues his account of the latest instalment of his imagi-nations campaign, which brought players from around the UK together at the ﬁnal showdown weekend in Ayton, Yorkshire. This month, we meet the players and consider their strategies. And finally we have show reports from Broadside 2016 by Mick Sayce and Bovington 2016 by John Treadaway. In his Briefing The Editor notes that he’s unlikely to ever forget issue 400, not just because of the magnificent milestone, but also because it coincides with historical events in Europe. In World Wide Wargaming, The Editor continues his research into the English Civil War, now on the hunt for useful uniform reference on the bookshelves, passes on news about Triples, offers some coaching for Twitter newbies and finds another pair of Blogs of the Month. The Editor (yes, he’ been incredibly busy this month!) picks up the reins of Forward Observer, setting out a manifesto for the future of the column and diving straight into drawing your attention to a clutch of excellent products that are hot on the market. Diane Sutherland gives us My chinny chin chin in her Continuing tales of a wargames widow. She hears husband Jon whispering, “Little pig, little pig, let me come in.” “No, no, not by the hair on my chinny chin chin.” “Then I’ll huff, and I’ll puff, and I’ll blow your house in.” He can huff and puff until his lungs collapse – he’ll never blow in Diane’s houses! In Fantasy Facts, John Treadaway is surrounded by goodies again, ranging from all sorts of aliens to airships, hovertanks, sci-ﬁ buildings, mechanised walkers and even more adventures from the ever-busy International Rescue. Paul Robinson of the Grimsby Wargaming Society opens a new regular slot, Wargaming my way, featuring a different wargamer every month telling us just what it is about the hobby that they love. Next time, it could be you! In Hex encounter, boardgame specialist Brad Harmer-Barnes returns sweating from his missions deep into North Vietnamese territory, keen to share the excitement of a favourite game. In his Send three and fourpence column, Conrad Kinch has some helpful suggestions for preventing newcomers to wargaming – or just those trying a new period – becoming baffled and bamboozled. 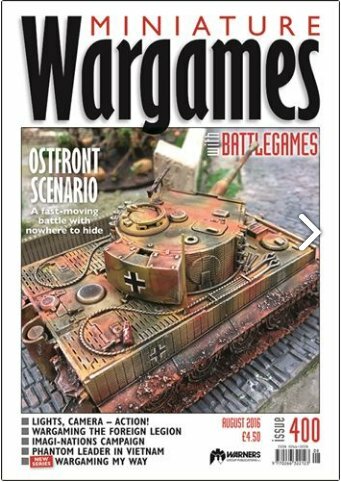 Of course we have our Battlegames Combat Stress Appeal; our regular review slot Recce; and finally, our competition this month features the brilliant Great War Tank Expansion from PSC Games. In our front cover photo, taken by the Editor, a Tiger 1 stalks the streets... This beastie was seen at Partizan in a game of Chain of Command being run by The League of Gentlemen Anti-Alchemists (yes, really!) which involved lots of troops sneaking around ruined buildings and over garden walls. Great stuff! Remember also to check out the new “Downloads” section on the new website at for additional material for Andrew Rolph’s article. And lastly, if you would like to feature in the new Wargaming My Way column, here’s the brief. Write about whatever you love about the hobby, the games you like to play, the periods/genres you love, how you like to paint, who you admire… Basically, write about why you love wargaming, and more importantly how and why you’ve ended up pursuing it your way. Length, no more than 2,000 words, plus supply half a dozen or so images to accompany the piece. So, over to you! If you’d like to feature, send your submissions in the usual way to henry@henryhyde.co.uk. I also advise using Dropbox or Wetransfer.com as a more organised way of sending your material, rather than just attachments to an email.